Many people set goals in their minds, thinking that the setting of the goal will somehow make things happen. If goal setting itself got things done, a lot more New Year's resolutions would be fulfilled by December 31st. The reality is that the setting of a goal is only the start of a productivity process. How we set and act upon goals will determine whether they in fact become realities. 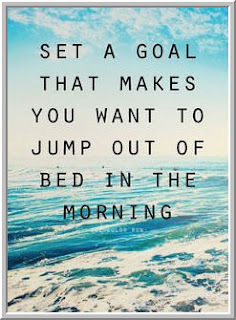 Think of goal setting as operating on three levels. On the largest, longest-term level, goals should represent our visions, aspiration, and ideals. No one was ever energized by an item on a daily to-do sheet. What motivates us is what inspires us. It's the vision, the ideal, the dream that makes us jump out of bed in the morning. The recent Forbes article is one of the most important things I've written, hands down. It explains precisely how large goals draw upon our reserves and energize us. When we tap into our deepest sources of motivation--our most fundamental ideals and values--we no longer have to push ourselves to do things. We are now pulled toward our desired future. It is the function of medium-term and short-term goals to divide and conquer, making the achievement of the grand goal challenging but doable. When we create short and medium-term goals that move us forward meaningfully, we create small wins that accumulate into a more general sense of winning. Those shorter-term goals organize us, but also ensure that we're not just doing things right, but also doing the right things. When you read about the woman who is running 50 marathons in 50 days in support of a cherished cause, you realize that the right goal setting makes us far more than we are in our ordinary, daily lives. The right goals form the structure of our days and weeks, but also transform us. The art of goal setting is knowing what will bring the best out of you and making that a meaningful part of your daily reality.